We test drove Nissan's Electric. Verdict: Seems like a good deal for the price. Here are the facts and figures. Why bore you with lead paragraphs and transitional phrases? Here are the facts and figures as well as a quick review of the prototype of an electric car from Nissan. The final version of the car will look different than the prototype – the outer shell actually comes from an existing car – but the electronics, componentry and overall performance are essentially the same as what consumers will get when the car comes out in late 2010. The Drive: Quite good. Like all electric cars, the EV-02 is almost completely silent. The most noise came from the tires rolling over the pavement and the wind. (The window was down.) It turned and handled like a normal economy car/sedan. "It will be 100 percent new. It will not be a conversion of something from today," said Mark Perry, director of product planning at Nissan. Acceleration and Braking: No Tesla Roadster here. It took about four seconds to go from zero to 60 kilometers an hour, or 37.5 miles an hour. The Tesla can do zero to 60 in under four seconds. Still, the acceleration was somewhat consistent and I could have kept picking up speed if I hadn't had to brake to stop from running into a cement wall. Exciting, no, but it was more like a Honda Civic than a golf cart. The car, though, did not exhibit the same sort of automated stopping power you feel with the regenerative braking systems while in a Tesla Roadster, or even a Prius. $20,000 to $33,000: That is the price range that Nissan is roughly aiming for. The price also does not include the $7,500 tax credit the federal government will give to the first 200,000 buyers of plug-in cars. Factor that in and the price goes to $12,500 to $25,500. The state of California is also contemplating additional credits. 90 Cents: The cost of recharging the battery completely, based around a somewhat high 14 cents per kilowatt/hour rate. 15,000 miles of driving will run you around $600 at that rate. A car running on $4 a gallon gas will consume $1,950 in fuel, the company claims. $810 million: The net loss Nissan reported in February. The company also plans to cut its global workforce by 8.5 percent to 215,000 by the end of next fiscal year ending March 30, 2010. As with General Motors, electric cars are a lifeline. Four Hours to 26 Minutes: The car's battery can be fully recharged in about four hours on a 220-volt outlet. Most homes and commercial businesses can get 220 volts in the U.S. A high-powered charging station with 480 volts can charge the battery in 14 minutes. Those don't exist, but several companies have proposed building them (see Is Nissan Building a Car That Charges Itself?). The state of California has issued a request for proposals to have some built, according to Perry. Federal stimulus funds will also be available to those who chose to build. 14 Hours: That's how long it takes to recharge if you plug into a standard 110-volt outlet at home. $500: The estimated cost of a home 220-volt charger that will be released with the car comes to $500. Seventy percent of charges will likely occur overnight at home. 60 Percent: The car, even if it charged up completely on coal-generated electricity, would generate 60 percent less carbon dioxide than a gas-burning equivalent, said Perry. The comparison doesn't include the carbon produced in mining coal. However, it doesn't include the cost of parking armies and navies in the Middle East to secure oil shipping lanes either, he added. It just compares the carbon dioxide produced in generating and consuming electric power versus burning gas. One hundred percent coal is a worst case scenario so in most states, the car will run cleaner. 70 Percent and 40 Percent: Seventy percent of carbon dioxide comes from cities and 40 percent of that total comes from transportation. Cars in urban areas thus account for around 28 percent of carbon dioxide. 100 Miles: The projected range. All EV manufacturers will have to prove that their cars actually hit their projected distances, but it seems good compared to others. 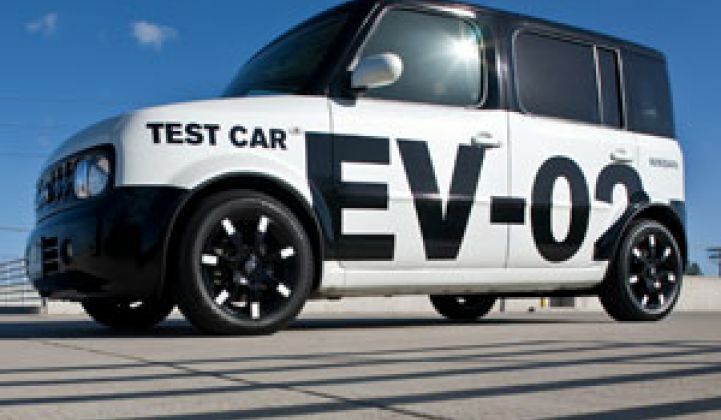 If the EV-02 costs $27,000 and goes 100 miles, it can be said to have a dollars per mile rating of 270. The Think City costs close to $40,000 after battery costs are included and goes 112 miles, giving it a dpm of 357 (see Think's Electric Car Is Here but Bring Your Wallet). Lower is better. This is actually a scale/rating I made up so feel free to criticize it. The Battery: The battery, developed through a joint venture between Nissan and NEC, is a lithium-ion manganese battery made up of rectangular layers of battery material stacked on top of each other and laminated together, sort of like plywood. The battery is similar to the shape of prismatic lithium-ion battery and, like a prismatic, takes up less room than cylindrical cells. But it is not a prismatic battery. "It is lithium manganese in a gel," he said. Other car companies and battery manufacturers (Imara for one) are also developing lithium manganese batteries. The battery will have a 2.5 kilowatts per kilogram power density and a 140 watt/hours per kilogram energy density. 1998: The year the first lithium-ion battery powered car came out. Nissan put a lithium- ion battery in its Altra EV. Like other electrics of that era, it didn't live long. Is the Battery Better Now? Yes, claims Nissan. It weighs about half as much as the 900-pound lithium-ion battery in the Altra EV. The old battery had a cobalt instead of a manganese cathode: lithium cobalt batteries can have safety issues. The new battery also has safety issues. Will It Work in Cold Climates? Yes. Warm ones too. The company is looking into ways of adjusting the size of the battery and the overall performance of the car if it will be sold in cold climates. Car heaters can sap battery power. Removable Battery? Cars sent to Israel to participate in a trial with Better Place will have batteries that can be swapped for a more rapid recharge. It is unclear if Nissan will employ the same concept will be tried elsewhere. 99 Percent: The car is 99 percent recyclable and that includes the battery. The factory, which for U.S. cars will be in Tennessee, will also have some wind power. 10 percent. By 2015 or so, Nissan hopes that 10 percent of its production fleet will be electric. Initial Markets: Tennessee, the San Francisco Bay Area, Oregon, Tucson, San Diego. The first customers will invariably be owners of fleets of cars.